The miniature altar from Morgantina. Also, you are not likely to have seen one of these before. Virtually no objects of its kind are currently known to have survived from antiquity. Have a good look at this unique and beautiful piece, to take in the extraordinarily fine craftsmanship that went into it and the beauty that was achieved – and then let me explain what makes it so interesting beyond pure aesthetic enjoyment. There are three fascinating stories to tell: The nefarious tale of this object’s “appearance” far from where it was discovered, the analysis of what it actually is, and the reconstruction of how it was lost over twenty-two centuries ago. In 1984, the Metropolitan Museum in New York announced the acquisition, two and three years before, of two lots of ancient metalwork from an antiques dealer in Switzerland. The price came to 2.7 million dollars. For various reasons, it was clear that both groups of objects belonged together. They comprised a total of 15 precious pieces of extraordinary quality, made of gilded silver and belonging to the Hellenistic Period (late 4th to 1st century BC) of Greek art. Most of the items were bowls and drinking cups, but a few other artefact types were also among them, such as the one discussed here. The excavations at ancient Morgantina on Sicily.. It was claimed that the group had been in private ownership for some time and may have been found in Sicily. But as soon as it was announced and exhibited, the hoard aroused the suspicions of archaeologists working in Italy and of that country’s cultural authorities. Rumours started spreading that the metal treasures had been illegally excavated at Morgantina, a famous ancient Greek city on Sicily, only a few years earlier, to be smuggled out of the country and sold abroad. In spite of the Met’s consistent denials, the affair turned into a scandal and a blot on the museum’s reputation. Malcolm Bell, the American excavator of the site, was well aware of the major scale of looting taking place in the area. He was soon convinced the objects might indeed be from Morgantina. 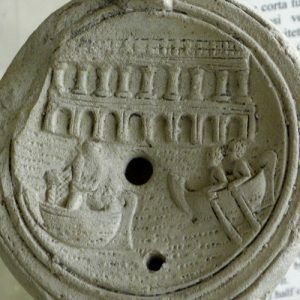 In 1998, confessions by individuals involved in the illicit excavation led to the rediscovery of its findspot: two holes dug under the floor of a Hellenistic house at Morgantina. Before long, the 15 pieces of metalwork became generally known as the Morgantina Treasure. In 2006, under increasing pressure from the US and Italian authorities as well as the archaeological community, the Metropolitan Museum agreed to share custody of the objects with Italy. The Morgantina Treasure returned home in 2010, to be exhibited in the archaeological Museum at Aidone, the modern village next to ancient Morgantina. Detail of the altar’s decoration. One of the objects in the “treasure” is the one we show you today. It is a miniature altar, only about 11cm (4.3”) high and weighing about 370g (13oz). 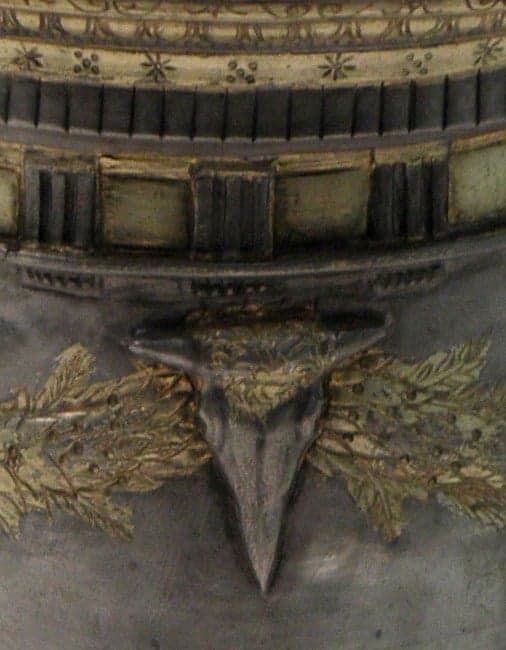 It is an extraordinarily fine work, its top and bottom parts mould-made, while the especially fine sculpting of the central cylinder was hammered out from behind in the repoussé technique. Note the fine ornamentation, the Ionic dentil and the Doric frieze of metopes and triglyphs in the upper register. Also note the selective use of gilding to accentuate certain details. Most remarkable, however, are the four bucrania, bull’s heads in the centre, each decorated with a gold star and all connected by a gilded vegetal garland. We know similar designs from full-sized altars of the Hellenistic and Roman periods. We also know other Greek miniature altars, but they are usually fairly simple affairs made of stone or clay and probably for domestic use. As a fine and ornate miniature altar made of precious metals, the Morgantina altar is unique so far. Others must have existed, but the fact that material like gold and silver can be melted and reused has condemned them to oblivion, along with many other priceless objects from the past. 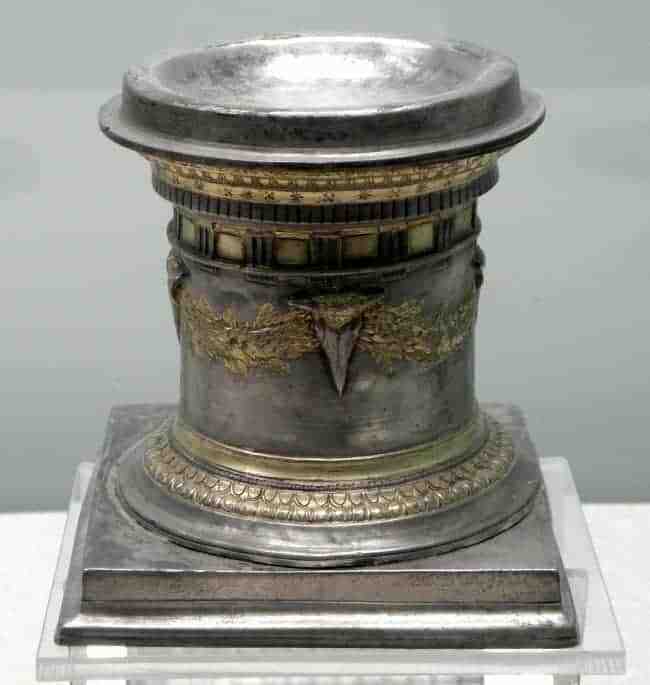 Ancient Syracuse, only 80km (50mi) from Morgantina, was known for its skilful silversmiths, so it is likely that the altar and the other objects had been produced there, probably around the mid-3rd century BC. Roman marble altar, Rhodes Archaeological Museum. Presumably, our altar served the same purpose as its full-sized equivalents: sacrifice to the gods. Due to its small dimensions, we are hardly thinking of the burnt animal offerings alluded to by its décor, but of small quantities of valuable or symbolically significant materials, such as wine, oil or perfumes. Whether it belonged to a household or a sanctuary cannot be assessed. 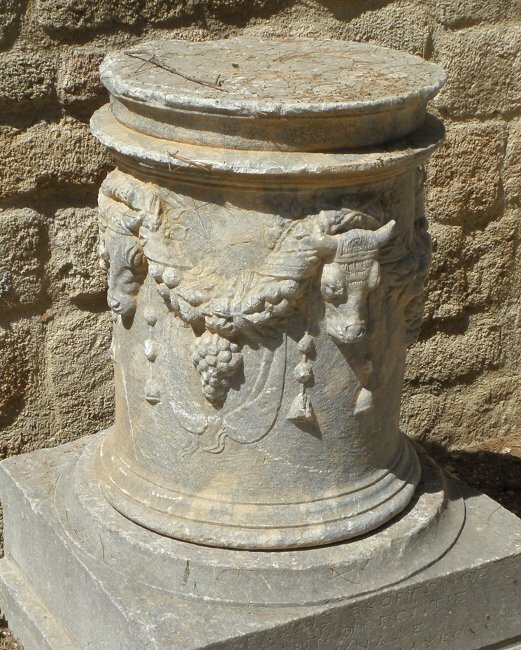 Two inscriptions on the base indicate its dedication “sacred to all the gods”, and it being the property of a man called Eupolemos. The entire ensemble of the Morgantina Treasure suggests ritual or religious use for all the items, not least as inscribed dedications to the gods occur on several. Beside the obvious function of the altar, we are probably looking at the vessels used for libations (liquid offerings) and/or at ritual banquets. Finally, what events led to the preservation of this rare object and the rest of the Morgantina Treasure, buried under the floor of a house and thus protected from the eventual destruction that was the fate of most such material? 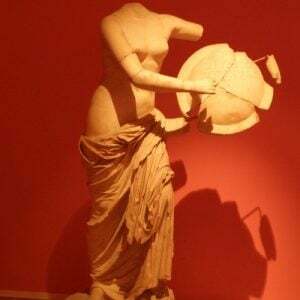 Another story for another day: The recently repatriated “Venus of Morgantina”. The answer can be puzzled together from a mixture of archaeological and historical evidence. When the holes first discovered by the illicit diggers in 1978 or 1979 were re-examined in 1998, archaeologists found a small bronze coin that had been overlooked by their forebears. It can be dated to between 214 and 212 BC. At that time, the Second Punic War, the struggle between Rome and Carthage over control of Sicily, was in full flame. The historian Livy reports that after defecting to the Carthaginian side, Morgantina was attacked and conquered by the Romans in 211 BC. 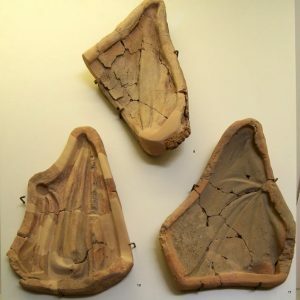 Thus, we can assume that a citizen of Morgantina named Eupolemos, whose existence is also indicated by an inscription on a lead tablet found at the site, and who may or may not have been a priest, was the owner or custodian of the objects that make up the Morgantina Treasure. Prior to the Roman attack, he or his heirs buried the valuable metalwork under their house, hoping to recover them later. That, of course, never happened – perhaps the owners did not survive the defeat, or maybe they were never able to return to the site and dig for them. Their loss is our benefit – the Morgantina Treasure is one of the finest ensembles of Hellenistic silverwork to have survived. According to the 1996 agreement, it will be exhibited in alternation between the museum at Aidone and the Met, changing location every four years. Renegotiations are currently underway. Pending those, you can admire the treasure in the Aidone Museum on our Exploring Sicily tour, along with other major works of ancient art recently repatriated to Morgantina.